Home/Agriculture, Neoliberalism/Reshaping the Debate on Land Alienation in Africa: What are the Origins of Social Change? Photo taken in a village in southern Karamoja, Uganda, courtesy of Matt Kandel. Matt Kandel is a Newton International Fellow in the Department of Development Studies at SOAS. One Monday afternoon last August I was seated underneath a large palm tree with my friend, Simon, in Soroti Town in rural eastern Uganda, both of us relaxing and seeking a minor respite from the equatorial African sun. The subject of our conversation was the weekend-long clan meeting that he and his family had organised in their village. The purpose of the gathering—which most importantly included clan leadership—was to resolve conflicts within the family over the division of their customary land. His father never formally allocated plots of land to him and his brothers before he passed away 14 years ago (patrilineal inheritance is practised in this region), and the clan had yet to appoint a new steward of the land. Further complicating matters is that one faction of the brothers has been keen on privately titling the land, something that has rankled the others and clan leadership. Unfortunately, the eldest brother (there are nine in total, including Simon, who is the third oldest and in his early 40s) refused to attend the meeting, essentially extinguishing any hope of resolving the outstanding issues. Since that afternoon in August, two of Simon’s brothers continue to gradually encroach onto what Simon believes is his plot of land. Tensions between the brothers show no signs of abating; rather, they are rising. The likelihood that this story will attract the attention of international media or serve as the subject of a slick NGO-produced documentary on YouTube is slim. Yet, it captures crucial dynamics that underlie conflicts over land across rural Africa. This includes the significance of political dynamics on the family and clan levels, as well as the ways in which disputes can go unresolved for years—even decades. It also demonstrates how dispossession of land may occur in the form of gradual encroachment. Those in Simon’s family who are opposed to privately titling the plot of land (and consequently removing it from customary tenure) are concerned with the potential for future dispossession, as titled land is more valuable and easier to sell outright. They fear that the pro-titling faction of brothers will at some point conduct a sale behind their backs, pocket the cash, and leave them bereft of land and livelihood. Indeed, when it comes to land in Africa, small-scale disputes unequivocally do not drive the research and media agenda. Instead, it is large-scale land alienations, or ‘big land grabs’, that currently draw the spotlight. These cases—despite work by some scholars (e.g. Oya 2013) who show that they are not always accurately portrayed—typically involve transnational corporations (in collaboration with national governments) that seek to acquire tens of thousands of acres of land for purposes of agricultural investments. This recent swell of enthusiasm for studying large-scale land acquisitions (hardly something new in Africa, incidentally) reveals something deeper about how researchers, journalists, and social activists continue to perceive societies south of the Sahara. For many writing on this topic there is a strong preference for drawing on concepts such as neoliberalism and neocolonialism in their analyses. More importantly, the general thrust of these concepts (necolonialism, in particular) is to emphasise the primacy of exogenous forces in shaping social relations in Africa. The upshot of this is a nuanced elision of agency: local actors—along with the networks and institutions through which they negotiate and contest access to varying forms of power—are rendered minimally capable of exerting meaningful historical impact in their own societies except when they are reacting to (such as resisting) external forces. Moreover, the productive relationships in which local actors are embedded—something that is better analysed through the concept of social differentiation—often go ignored, particularly in rural areas. The preference amongst researchers for studying large-scale land expropriation reveals a broader theoretical orientation that consistently seeks to understand dispossession, capital accumulation, or resistance mainly through exogenous interventions. While I am certainly not suggesting that large-scale land alienation is unworthy of study (nor am I implying that it fails to demonstrate dispossession or offer fertile grounds for researching resistance), it is telling that the larger theoretical arguments derived from these studies typically centre on the hegemony of transnational capital or the neoliberal structuring of interstate relations; in a word, predominantly externally driven social forces. The overarching story line is one of continual foreign conquest of Africa, albeit through slightly different mechanisms. Shifting class relations internal to these societies—including within the oft-presumed socially undifferentiated agrarian areas—is apparently deemed by many to be no longer of any political and economic consequence. Yet, it should be recognised that the vast majority of conflicts (and potential dispossession) over land in Africa resemble Simon’s case, as they are predominantly local-level phenomena. Rather than transnational capital and ruling elites, they mostly feature family members, clan mates, and local-level traditional and statutory authorities. They are far less sensational as well with respect to scale (perhaps this is another reason for the fascination with large-scale land alienation? ), for disputes often involve only 20 acres of land between two clans or a vaguely demarcated property border between two brothers. They are also much more likely to be immediately rooted in disagreements over customary allocation rights or inheritance, and are quite often deeply embedded in very particular historical developments. Such developments include precolonial migration patterns; precolonial political conflicts between kingdoms and clans; the demarcation of specific tribal zones during the colonial period, which might have created long-standing resource advantages—such as superior access to fertile soils and water—for particular social groups; or intra-state violent conflicts—some of which are primarily class-based—in the postcolonial period between pastoralist and farmers or governments and local insurgencies. Furthermore, land disputes in agrarian Africa express intra-class conflict amongst peasant producers insofar as are they struggling for control over the primary means of social reproduction. As in Simon’s case, they also reveal how conflict within families may cut across class lines. The pro-titling faction of brothers represents the middle class in the family (several are civil servants, and one works at a private bank), while those opposed rely mainly on peasant agriculture for income. This multilayered class struggle should be theoretically situated within a context of increasing land scarcity (which places physical limits on extensifying agricultural production), low levels of agricultural productivity (which limits commodity production), and rising market values of land. Disputes over land also express political and social conflict in terms of how they map onto pre-existing kin, clan, ethnic, and generational cleavages. To put it succinctly, these are highly complex social phenomena that cannot be reduced to a simple narrative. Rising competition over land is often the most profound expression of social differentiation in rural Africa. For instance, in vastly agrarian Teso region of eastern Uganda—where I have conducted fieldwork since 2012—shifting class relations crystallise around competition over land. Land conflicts—of which the vast majority unfold on intra-family, intra-clan, and inter-clan levels (with overlap)—serve as the sharpest lens for viewing political economic transformation in Teso. Since the early 1990s, processes of social differentiation have been gradually driving the concentration of landholdings in a middle class and regional elite, and creating a growing surplus labour population that is heavily skewed towards youth. There is a growing segment of the population that pursues at least partial social reproduction through agricultural and urban wage labour. This segment is disproportionately comprised of youth—specifically those seeking wage labour in the trading centers and small towns—and many of them maintain only tenuous ties to their customary land. While the burgeoning segment of small-scale capitalist farmers face significant limits to capital accumulation—effectively, they are capitalists without adequate capital—one can still discern a fundamental restructuring of productive relations in the region. Without a doubt, global commodity price trends, transnational agricultural and financial corporations, and an interstate architecture dominated by states in the Global North affect social relations around land in Africa. Obviously, there is a fundamental interplay between exogenous and endogenous forces. But my research has led me to see that many of the most politically and economically salient developments in Africa stem predominantly from endogenous dynamics. A major risk of diminishing the significance of internal dynamics in analyses of African societies is a political one. 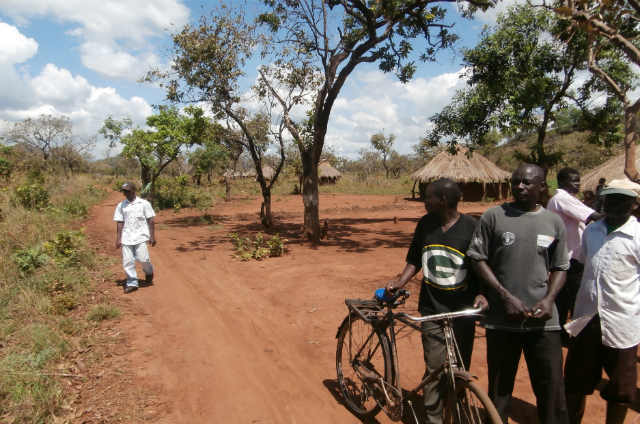 In Uganda, on the whole, the most intense violence stemming from conflicts over land pertain to disputes involving families, clans, and traditional authorities. It is rare that local newspapers do not at least once a week report on a locally rooted land conflict—often one that has been simmering between families or clans for years—that triggered a violent outcome. While one cannot predict whether this will be the outcome for Simon and his brothers if their dispute remains unresolved, it cannot be ruled out as a possibility. Ultimately, the cumulative political impact of rising competition and conflict over land within African societies is greater than that stemming from externally driven, large-scale land alienation. Righty you raise the point that internal dynamics are often not dealt by formal power structures such as state, NGOs, etcetera. And then you stress the point that shifting class relations were crystallized ‘around competition over land’. However, without the formalization of land titles for some, probably, intra-family competition over land would have not occurred to Simon’s family thus avoiding processes of dispossession, differentiation and local conflict. So, my question is: to what extent are dichotomies such as external-internal or exogeneous-endogeneous helpful for analysis? I would be interested to know ‘how’ and ‘why’ one faction of the brothers privately titled their land.